I recently was given the opportunity to chat with the bassist from progressive metal giant Between the Buried and Me. Below you can read highlights of our conversation in which we cover Russian Circles, Dan’s new band Trioscapes and even an AMA they conducted on reddit not too long ago. Brootalisk: How did you feel about the critical acclaim towards The Parallax II? Do you think it’s been a long time coming, or were you surprised to see it atop many year end lists? Dan Briggs: Definitely not. We set out to kind of make our own version of a rock opera, just trying to make an over the top, thematic, progressive metal, operatic story, and it ended up being 70 something minutes long. You never know how something is going to turn out and be perceived. So we in the studio really felt like it was the best thing we had done, and that’s a hard thing to try to instill on people before they even hear the record. With all that in mind, we’ve been pleasantly surprised with how it’s been received. It’s definitely a bit of a shock for such a long record to be embraced by so many people. For me, when I listen to it, it doesn’t quite feel as long. The important thing about it was the flow, and I think there’s a lot of that that contributes to the theatrical feel that we were going for. We’re definitely excited about it. Brootalisk: Were you surprised at all to see it atop of many year-end lists? Dan: You know, I didn’t really see that it was, but that’s cool! Brootalisk: Oh yeah, it topped a lot. Brootalisk: Your upcoming tour with Coheed and Russian Circles is obviously in support of The Parallax II. How much of your set will be devoted to new material, and can fans expect some of their favorite old tunes to make it into the set list? Dan: It’s gonna be about half new stuff time wise. We didn’t want to do too much off of it. Of course, for us we just want to got out and play the whole thing, but we can’t. It’s kind of a matter of picking out songs that we were really excited about and that we wanted to play, and that we though would be a good balance for this tour, and finding older songs that compliment those well. We have such a big catalog now that making a set list is almost like creating an album. You want to have a good flow and have it come down at the right moments to give yourself and the crowd a break. Our music has a lot of those dynamics naturally, so it’s just finding the right mix of songs. It gets harder and harder because we keep putting out records, so we just have more songs to choose on. But, it’s the first tour we’re doing in America since the album came out, so hopefully people will want to hear new stuff. Brootalisk: How much time are you given for your set? Dan: We have around an hour. Brootalisk: I’ve heard some unique and downright strange ways band members ready their bodies for a set. Do you have a preshow warm up? If so, what does it consist of? Brootalisk: I was surprised, but very happy, to see that Russian Circles were chosen as the supporting band for the tour. Did you have any influence in choosing them to support your and Coheed’s tour? Dan: We did! What originally happened, we were supposed to be in the middle of a headlining tour at this point that was going to involve Russian Circles as well, and I think Coheed had some tour packages fall through, so they picked up our tour package and added it to theirs. Russian Circles was a band that we picked to go on tour with us, and now they’re going on tour with Coheed and us! Brootalisk: What’s your opinion of the band? Dan: They’re cool! I’ve been getting into some of their more recent stuff. I remember listening to their very first record when it first came out, and I thought it was cool, but I just kind of fell off after that. Not for any reason, I just kinda stopped listening to them. They’re a very interesting band and very interesting kind of instrumental band, so I think it’s going to be a very neat package. I think every band has their own crowd. I’ve been a huge Botch fan, so I’m extremely excited to nerd out on their bass player a bit. Brootalisk: Going off topic a little bit, you conducted an AMA on reddit before your newest record released. Can you give some insight on what kind of experience that was for you? Dan: It was fun. I had never been to reddit before, so I didn’t know what to expect. I had no idea. I didn’t know the format at all. When it started, we weren’t together at all. We were at our respective homes, so I didn’t really know what to do! But it was fun! It was cool. There were a lot of people that asked questions, and we tried to answer as many as we could. Paul’s personality definitely shined through. He’s a very sarcastic and funny guy, something that people might not necessarily get just from watching him play on stage or reading his interviews. We did it with the hope that it would be a bit more laid back and teach the fans more about us than they normally would get. Brootalisk: Would you ever do one again? Dan: Yeah totally, now that I actually understand the format! Brootalisk: Speaking of internet popularity, are you aware of Protest the Hero’s attempt to go independent with their latest album? What are your thoughts on that? Do you think it’s a potentially viable way for bands to start funding an album? Dan: It seems like it, if they raised that much money! To make an album, we’ve probably only ever had about half that much. I guess you don’t really need that much to make an album nowadays. But, I’m glad it’s an option for people to come out with their own stuff. Artists have been doing that for decades. Peter Gabriel has been putting out his own records since the ’80s, so it’s nothing new, but I think it’s reached the point where people who are underground can do it. I think a lot of that has to do with the fact that you don’t necessarily have to rely on making a CD that has a national distribution that’s going to be in every Best Buy or whatever. I think the fact that you can get your music out through the internet, from either digital files or even your own webstore, that’s a huge thing. And maybe you can get a smaller distribution deal to sell at indie stores. That’s perfect, what else do you need? How metal? 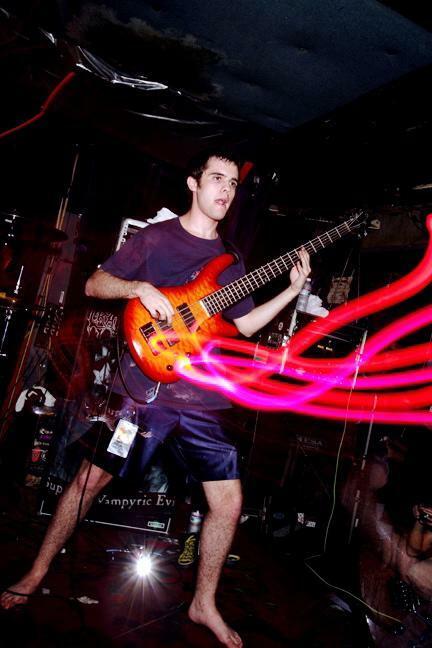 Dan’s so metal he shoots laser beams out of his instruments. Brootalisk: What are your plans after the tour? Dan: BTBAM is going to Europe in the Summer, but right after this tour my group Trioscapes, which is a three piece fusion project with bass, saxophone and drums. We’re doing a couple weeks on the East Coast and we’re going down to Puerto Rico to do a masterclass and a concert of course. That’ll be fun. I’m going to be working with my third group Orbs. We just finished writing a new album that I’m probably going to try to and record the guitars, bass, and drums in May before BTBAM goes to Europe, and hopefully I can finish that in the fall. So, you know, staying busy. Brootalisk: Do you think Trioscapes would ever tour with Tosin Abasi’s side project, T.R.A.M? Dan: Yeah, you know it was really funny because we’re all good friends, and we all went to different countries touring, so we hadn’t seen each other for a long time. So we find ourselves in Europe together after a year or so and we ask them what they had been up to, and they were like, “Oh we started this fusion group with a saxophone player!” and when they asked me what I had been up to, I was like, “Oh I started this fusion group with a saxophone player!” That was weird. It ended up because we just have similar influences. Tosin and Javier are big into Mahavishnu Orchestra and John McLaughlin, and John McLaughlin is a big influence to me and everyone in Trioscapes, and that was sort of a chance thing. However, I don’t think they have live ambitions. I kind of made it pretty vocal from the get go. Trioscapes started as a live band, after all. It’s very much an active group. So, I would love to, and I think that would be super fun. I’m sure kids would love to see that, but I think there’s a better chance of seeing us on tour with Animals as Leaders than seeing T.R.A.M.